The assignment is now complete and you want to see how you did, right? Well, click the Summary tab on your course’s homepage. This section and the subsections explain what all of those numbers mean and how well you did on the assignment. We’ll also explain where there might be a point of concern, which should cause you to ask your instructor some follow up questions to improve your work. The first section on the page is the Overall Course Performance. It is followed by each individual assignment, in reverse chronological order with the newest first. This section contains information about how you are doing in the course and how you stand among your peers. Your Cumulative Grade is the average grade of all of your assignments up to this point. This should generally trend higher, and improve after each assignment is completed and your work improves. Your Cumulative Points is the total amount of points you have earned in all completed assignments. This is the total of all of the points accumulated so far. Your Cumulative z-score… well, some statistics now…this is how far you are away from the average cumulative points of the entire class. Z-score is the difference between your cumulative points and the class average, divided by the standard deviation of the cumulative points in the class. Your Cumulative Percentile Rank is the percentage of your peers who have fewer total points than you do. Think of this as a standardized test percentile. If you have a 90% cumulative percentile rank, then you have a higher number of total points than 90% of your peers. First, it’s important to note that the first set of numbers in this section pertains only to your peer group that you exchanged your Submission and critiques in this assignment. During Review and Reaction, there were a few elements at play. The most important one is the idea of perception. Understand it and the numbers make better sense when we explain them. Perception is the idea of how well a person completed the assignment. This can be your peers’ ideas of how well you completed the assignment or your idea of how well you completed the assignment, or your idea of how well they completed the assignment. Here is a brief definition of each statistic. Speak to your professor if you need further clarification. Your ranking in the group – Of all the peers in your group, this is how you rank in the order of attainment. Attainment Index is the aggregation (average) of your peers’ perceptions of your work. Bias Index measures your skill as an evaluator. It shows how much you contributed the Controversy of your peers’ work. Controversy Index indicates the variability in the perceptions of your work. Did have a similar perception of your work? Or, did your peers have very different perceptions of your work among themselves? Self-assessment Inaccuracy shows how much your perception of your work from your peers’ perceptions of your work? In general, this indicates your self-awareness. Attainment Points – This is the Attainment Index translated into a score based on maximum total points for each component of the assignment. Your instructor assigned a maximum total number of points for the Submission and critiques. Total Points is the sum of your Attainment Points plus the effects of the Controversy, and Self-assessment inaccuracy combined into one statistic. Your instructor can assign weights to those three stats to reflect how much bearing they should have on your grade. This is where the in-group statistics end and once again you are being measured against the entire class enrolled in the course. 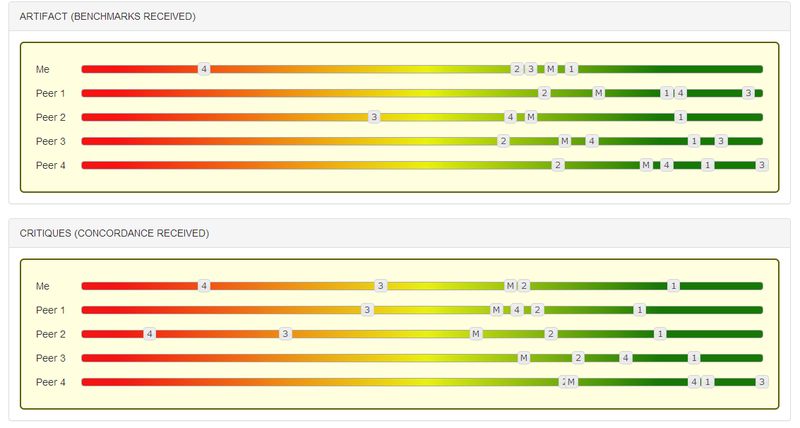 Z-score shows how much your Total Points score differs from the class measured in standard deviations. Percentile – What percentile you are compared to all of your peers’ scores on the assignment. Once again, think of this as a GMAT, GRE, SAT or ACT or other standardized test percentile. A higher percentile is better here. Peer (Suggested) Grade – Given the criteria that your instructor has entered for assignment, Mobius SLIP suggests a grade for you. This might be different from your Percentile rank. This is because your Percentile is measuring your position among your peers; however, your Peer Grade is taking into account your instructor’s expectations. Instructor (Your Final) Grade is where your instructor can manually change your after reviewing you and your peers’ work. It could go up, down or stay the same. These are graphical representations below all of the numbers and statistics. They look like those magical floating bars you see when you are benchmarking someone’s work. These, instead, don’t float. They do show you how your peers benchmarked you in the Review and Reaction they gave. You also get to see how you benchmarked your peers’ Submissions and Reviews, in relation to how your peers benchmarked your work. This will help to further explain all of those numbers discussed earlier. Next, you see your Submission including any comments your instructor may have made regarding your work. This may contain plain text as feedback from your instructor or it can contain an uploaded file or a URL link to a Dropbox file. 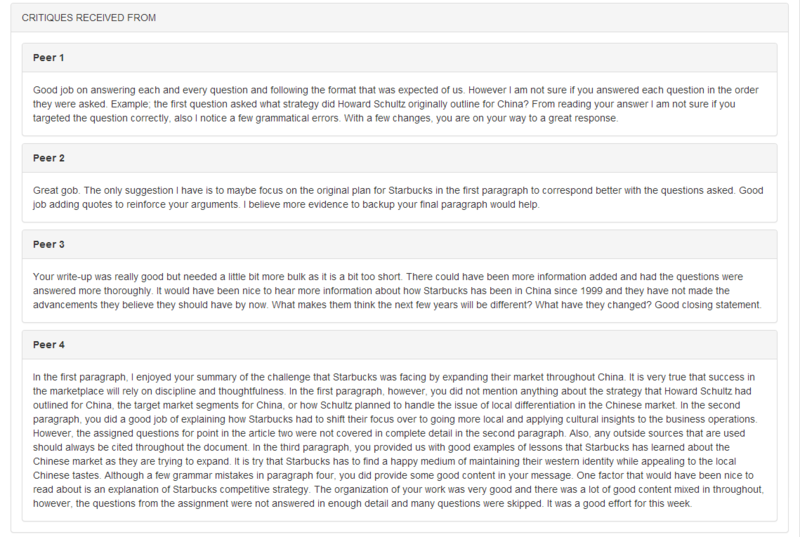 It is important to read the feedback here or review the uploaded file, as this will help you improve upon your work. You can correct errors, which will ultimately help you, either in this course, or in the future. Next, you will see your peers’ Reviews once again. These are here to allow you to reflect on your assignment more in light of your peer’s feedback. This is another place to where you can continue to gain valuable information, even after the assignment has closed and after your course has finished. Finally, you see your own Reviews given to your peers. Your Reviews may also have comments from your instructor. Wow! That is a lot to take in, especially all of the statistics. It might take a few reads and a couple of comparisons with your own results to fully understand it. In the meantime, if you have questions that were not answered so far in the guide, jump to the FAQ section. It contains helpful questions that have already been answered, some of which you might be thinking right now.